Dear eclectic trends readers, it’s Mette from monsterscircus. I hope you all enjoying your summer still. 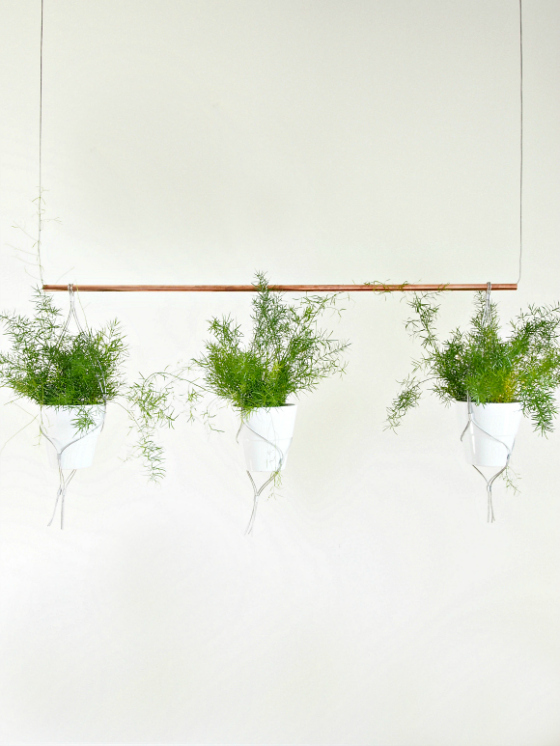 Indoor garden is a trend that’s hard to ignore, so today I’m going to share a DIY on how to make a contemporary hanging garden. 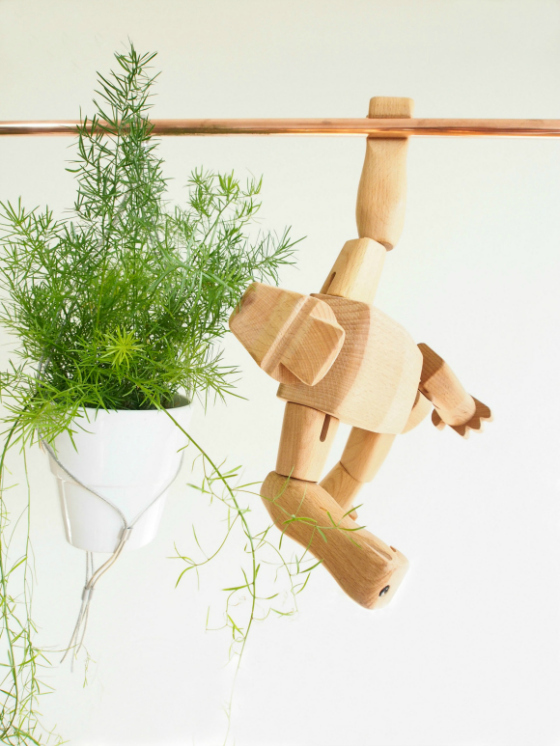 The macramé is a great way to make hanging plants but with this project you don’t have to be an experienced crafter – So let’s jump right into a triple trend project. 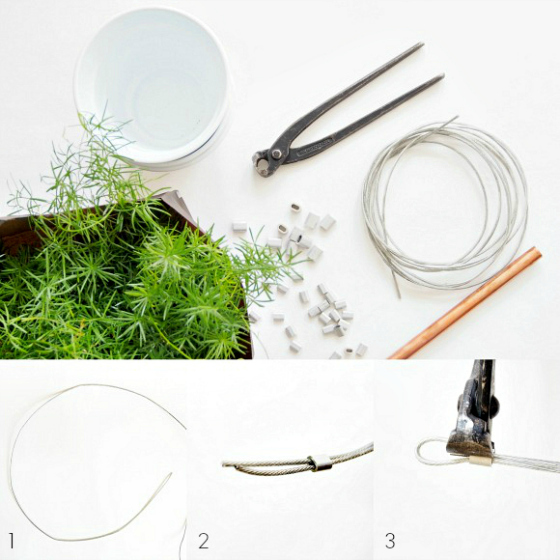 Plants, flower pots, copper tube, coated steel wire, 8 ferrules per hanging plant (remember to select the correct ferrule size for the wire diameter), pincers. Step 1. Cut 2 pieces equal lengths of wire, I made my ones 50 cm long, but cut them longer if you’re planning a long drop. Step 2. 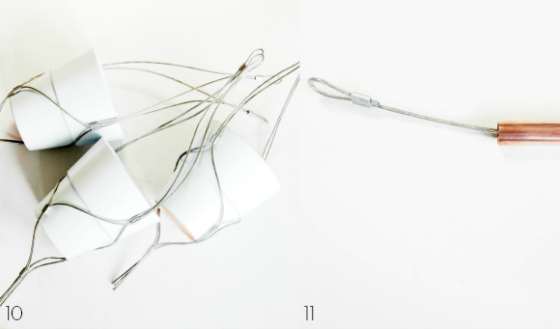 Find the middle of each pieces of wire and bend it. Pass the wire ends through a ferrule and place it about 5 cm from the top so you’ll now have a loop. Step 3. Crimp the ferrule with your pincer. Repeat with the other wire piece and so now you have 2 sections of wire. Step 4. 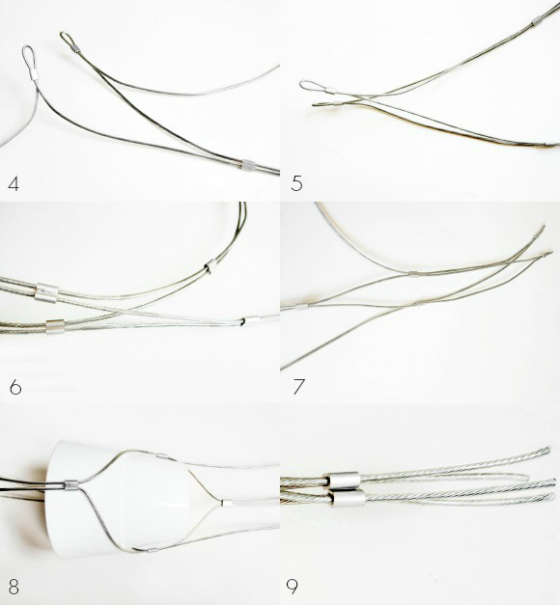 Gather the 2 wire sections by crimping a ferrule on one from each section of wire. Step 5. Repeat with the other wire so both of the two sections of wire is now joined. Step 6. About the same distance from the last two ferrules you’re going to join the wire sections as pictured. Step 7. Gather 2 more wires from each section and slide 1 more ferrule on each section. Step 8. 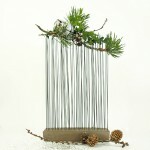 Now you going to make the resting base for your flower pot with the ferrules. Step 9. Repeat so all ends are closed and secured. Step 10. Repeat until you have 3 identical plant holder. Step 11. Cut a long piece of wire, I made mine 2 meters long. Pass each wire end through a ferrule and return to the other side to form an eye leaving a short dead end. Pass your wire through the copper tube. Place 2 hooks in your ceiling and that’s it! 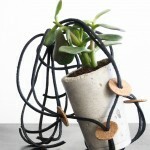 As you can see it reminds of the macramé but this one is a lot easier and gives a completely different look. 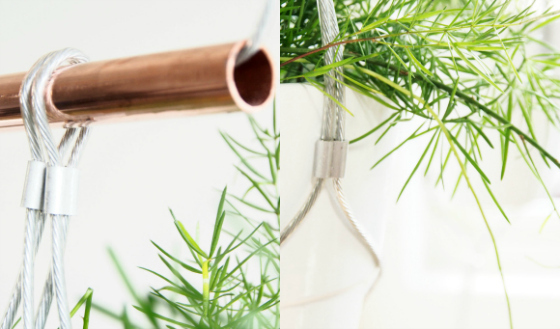 Gudy is always first with the new and noteworthy so of course I had to make a trendy project – Both the “macramé look”, the copper and hanging plants are pretty hyped at the moment so I tried to combine it in a new and modern solution. I hope you would be willing to try this one out, it’s both fun and an easy project, and it’s suitable for both your kitchen (imagine this with heaps of herbs). 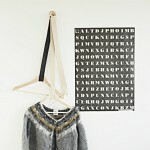 Or maybe hang it above you dining table and if you want a cozy look just add some string lights. Thank you so much for having me here today Gudy, it’s really a great pleasure for me and a thanks to you the eclectic trends readers for joining me today, have a wonderful day! 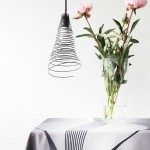 PD: Please take a look her at Mette’s last month project and see how to do a wire lamp shade. I promise it’s as amazing as this one! Creative and perfect, as always! Thank you very much for your sweet words – I’m so glad you like the idea! Hope you’re having a beautiful day! Such a super easy DIY! This would be so cool as a curtain in my greenhouse, with different rows of pots… hmmm new ideas! Thanks for sharing, Mette! Simple and stylish! Great work, Mette !!! Thank you very much! 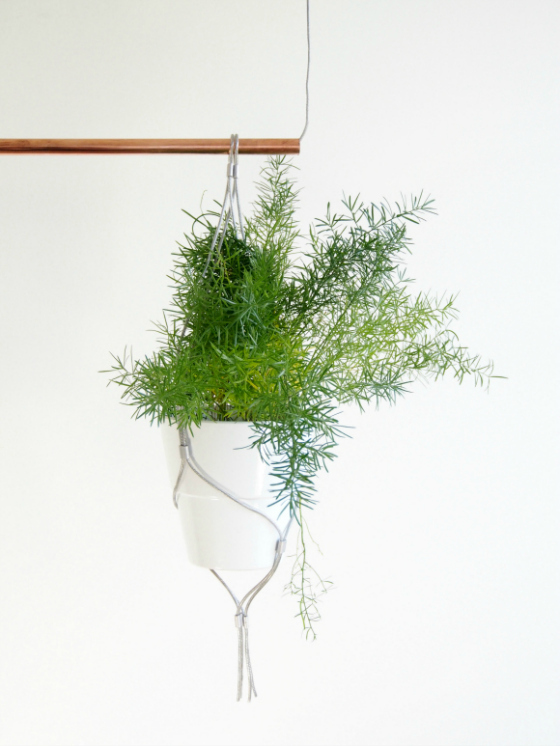 It was so much fun to create a hanging garden with wire :-) Have a lovely day! where is the handing ape/monkey from? I missed this project the first time around ~ love it! I don’t have a window in my kitchen but I love this idea for on the balcony. 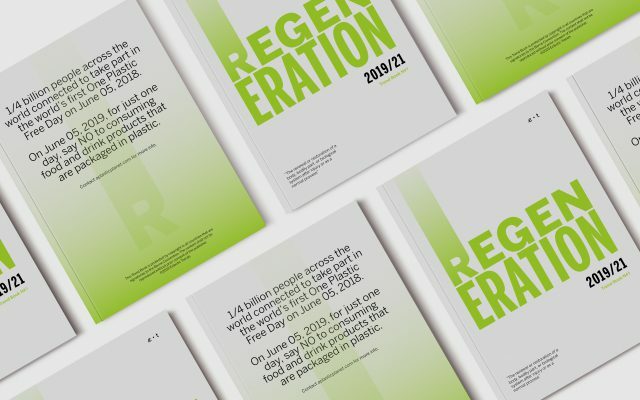 Thanks for your inspiration and creativity, Mette!